Beautifully shot, perfectly capturing the Spanish countryside and village life, auteur Asghar Fahardi’s (The Salesman, A Separation) latest is ultimately a deeply unpleasant narrative of revenge. Laura (Penelope Cruz – Volver, Vicky Cristina Barcelona) travels from Buenos Aires with her two children to attend her sister’s wedding. But the kidnapping of teenage daughter Irene results in long-buried secrets, family feuds and village animosities rising to the surface with devastating results. Former lover Paco (a solid and likeable Javier Bardem – No Country For Old Men, Vicky Cristina Barcelona) is there for a distraught Laura. But, over the course of 150 minutes, Everybody Knows, whilst eminently watchable, gradually slips into melodrama and (for Fahardi) unsubtle angst. After the execrable I’m So Excited, relieved to see writer/director Pedro Almodovar (Talk To Her, All About My Mother) return to his female-centric storytelling. But, sadly, Julieta is far from his best. Hidden family secrets worm their way to the surface as Julieta (Emma Suarez – The Mosquito Net, Hours of Light) re-evaluates her life following a chance encounter on the Madrid streets. A somewhat uninvolving, emotionally distant mother/absent daughter tale unfolds – loosely based on short stories by Alice Munro. Just four days to say goodbye for long term friends Julian and Tomas. Travelling to Madrid from Montreal, Tomas (Javier Camara – Talk To Her, A Gun in Each Hand) is on a mission to persuade Julian (Ricardo Darin – The Secret in Their Eyes, Nine Queens) not to give up his chemotherapy treatment. It’s a quiet, subtle film about male friendship. The chemistry between the two leads is palpable: a gesture, a movement is worth more than a thousand words. Writer/director Cesc Gay (A Gun in Each Hand, Nico & Dani) avoids maudlin sentimentality but in doing so strips the film of some emotional impact, resulting in an engaging but strangely distant story. The Puccios are a seemingly respectable Buenos Aires family living comfortably in an Argentina of the 1980s under the dictatorship of the military junta. But, like the country itself, respectability is only skin deep – patriarch Arquimedes (a menacing performance from Guillermo Francella – The Secret in Their Eyes, Rudo & Cursi) heads a criminal gang of kidnappers and extortionists made up predominantly of his family. It’s all based on a true story and the source material is rich in detail and potential – but sadly any lack of suspense is lost as director Pablo Trapero (Carancho, Lion’s Den) choses a matter-of-fact, somewhat dull approach. Disappointing. The bureaucracy faced by aid-workers over one day in the Balkans in the 90s whilst trying to solve a humanitarian problem. Authentic and respectful, A Perfect Day is a minor, engaging if rough-edged and inconsistent film that moves along at a steady pace in the telling of its story – just how will the team remove the dead body from the bottom of the well. A transnational cast reflects the make-up of the aid team lead by Benico Del Toro (Traffic, Sicario), with welcome humour provided by Tim Robbins (Mystic River, The Shawshank Redemption) and Spanish director Fernando León de Aranoa (Mondays in the Sun, Familia) making his (mostly) English language debut. 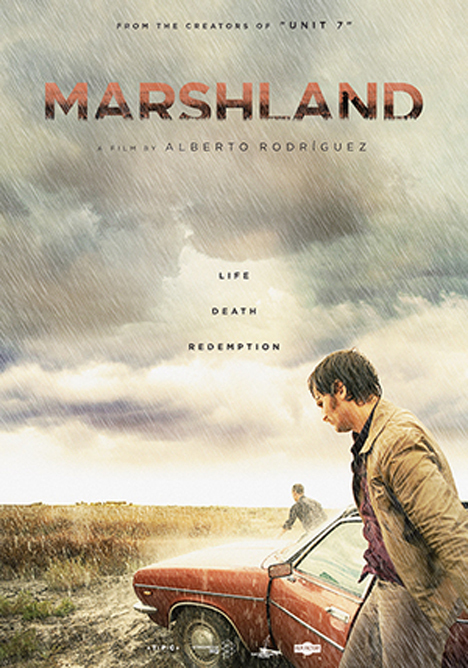 A deeply atmospheric Spanish Southern Gothic, Marshland is more of a drama than a crime thriller. There’s little sense of suspense – more a case of steady discovery by the two city detectives sent to the remote repressed southern marshland town of Villafranco del Guadalquivir to investigate the disappearance of two teenage sisters. But with its stunning cinematography and muted tones, the film, helmed by Alberto Rodriguez (7 Virgins, Unit 7) , effectively claustrophobic, set as it is in 1980 and the civil unrest and uncertainty following Franco’s death. Winner of 10 Goya Awards, including best film.